How can I type the degree sign (°) on a laptop without copying+pasting? So I use the degree sign fairly often and on my desktop I could always just use Alt-0176. However with my laptop I don't have the numpad so Alt-0176 doesn't work for me. Is there another quick way to type it? I don't want to have to copy+paste it every time (like I am currently doing) or use the Insert Symbol tool in Word. If there isn't a quick shortcut, is there a way I could remap a key or something to have a shortcut? In Word, hold down Ctrl and press 2. Release Ctrl and hit the spacebar. Are you sure you don't have a numpad overlayed on your keyboard somewhere? Most laptop keyboards do. If so, you would hit NumLock, and then you can do your regular Alt-0176 using the numbers on the numpad. 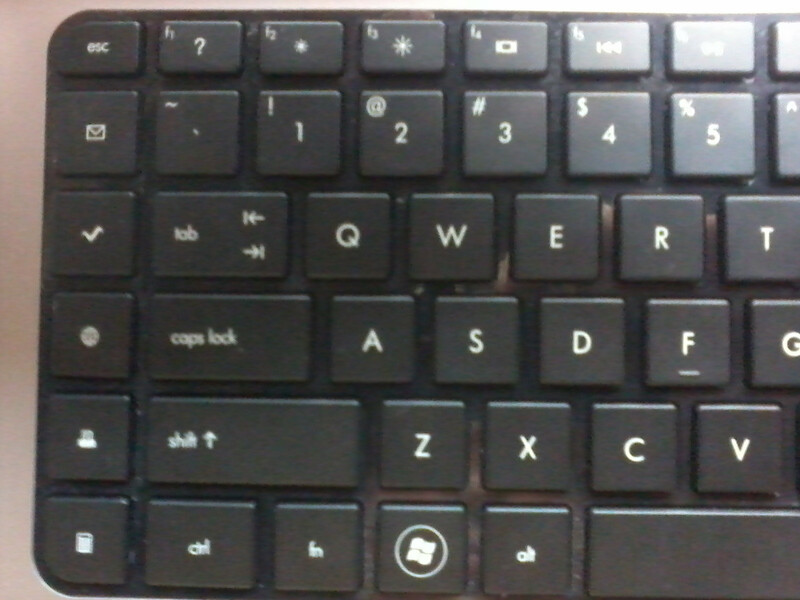 On my laptop keyboard, My NumLock is Fn+ScrLk. I expect AutoHotKey would easily be up to this job. Ideally I want this fix to work universally so I can use it in Word, Notepad, Firefox, etc. So thanks KRS for that for Word (turns out you also have to hit Shift to get that to work because it is Alt-@, Spacebar), but it doesn't work in Firefox. gatorbiddy: "Are you sure you don't have a numpad overlayed on your keyboard somewhere?" I haven't been able to find one. I'm using a HP Pavilion dv6. I can't find a picture of the keyboard mine has, but it doesn't have a ScrLk and I haven't been able to find anything in help on a numpad overlay. Most laptop keyboards have a Fn key. Usually the "Fn" lettering is in a different color (often a darkish grey-blue) and usually there will be a bunch of other keys with alternate labelling in that same color. Holding down the Fn key will give any of those keys its alternate function. 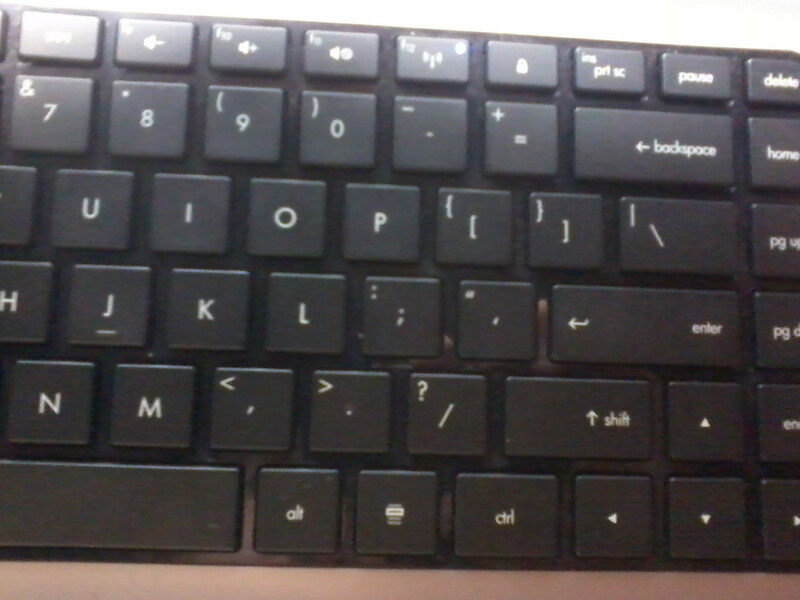 The most common way to implement a number pad on a laptop keyboard that doesn't have a real one is for the top-row 7, 8, 9 to be the number pad's 7, 8, 9; U, I and O become 4, 5 and 6; J, K and L become 1, 2 and 3, and M becomes 0. These alternate codes are accessible via the Fn key, and also become active if you hit Num Lock (not ScrLk). Num Lock itself might only be accessible via Fn. Are you sure your keyboard has no such alternate labellings? Apple removed theirs in 2007 or so on the MacBook Pro. Wouldn't surprise me if other manufacturers are doing the same. 8I would add to gatorbiddy, on my laptop it's 'Scroll Lk' that is the Fn key part of 'Num Lk', so it goes 'Num Lk', press-hold Alt, press-hold Fn, mj7o, release Fn, release Alt, turn off 'Num Lk'. But you can pretty much leave 'Num Lk' on as it does nothing without the Fn key and using the virtual numpad. Deflagro, look on these keys, '789uiojklm' and see if some of them have the numbers 0-9 in some other color, or with a little icon of some sort. My keyboard has them in blue and the Fn key is also blue. You may or may not need the 'Num Lk' key depending on the keyboard. My keyboard will not do the magic Alt-0176 without using both 'Num Lk' and the Fn key combo (without 'Num Lk' the Fn numbers act like the arrow keys on a full keyboard). No, the fn key is not a different color and there are no other alternate labeling on the keys (aside from the normal Shift keys). I tried holding down fn and hitting "uio" just to see if it worked and was not labeled, however it doesn't. FWIW my keyboard has a fn key, but no num lk...all my fn options are break, prt sc, sys rq, and then icons that mean hibernate, output to monitor, brightness adjust....etc. So I believe that you are capable of looking for num lk and identifying that it is not there. This HP support site says it might be Fn + numlock that enables the number pad. So maybe try your uio test again? In Pic2 what's that key above "+/=" ? Oh and FWIW on my Lenovo it's Fn+Insert/NmLk. Most of my function keys pull double duty. Deflagro, does that little 'lock' button above the '=' sign happen to have a number in it? Does it lock the screen or something? That sort of 'lock' icon is often used for Num Lock/Caps Lock, that might be worth trying. MikeMc: "In Pic2 what's that key above "+/=" ?" It's the lock key. It locks the computer and goes back to the Welcome screen where I put in my password to log back in. Sorry the picture is blurry. is there a way I could remap a key or something to have a shortcut? Yes, remapping software will do this. I agree with flabdablet's suggestion of AutoHotkey -- it will allow you to set up a hotkey/shortcut or remap a key to output the degree symbol. It has a lot of other features listed on the page that may be way more than what you want, but be sure to check the quick-start tutorial. Both are free. With either, you'll need to edit a file using a text editor and add a command to create your keyboard hotkey/shortcut or to remap a key. You'll probably also want to delete some of the pre-configured hotkeys. Obviously you can change the keyboard shortcut to fit your preferences, and/or add an additional shortcut for &deg; for when you're posting on the web. OK, I just checked the user guide and it's really truly true - HP really truly does make a laptop without any kind of numeric keypad; one more black mark against that company in my personal Book of Nongs. Just install AutoHotkey. You will find other uses for it too. Or do this ridiculous dance. Your call. Once you get the hang of using an IME it's not that awkward. I'm not sure if Windows has any simpler versions of Unicode IME, my Linux iBus IME has a shortcut version that supports rfc1345 (° is &DG) and a full Unicode version that is Ctrl-U XXXX for when you need the full Unicode range. I would try the IME route over AutoHotKey because it's part of the OS, will probably work everywhere, and instantly give you access to all characters through a common method rather than trying to add some custom ad hoc per character custom key binding. flabdablet: "OK, I just checked the user guide and it's really truly true - HP really truly does make a laptop without any kind of numeric keypad; one more black mark against that company in my personal Book of Nongs." Not only that, they hilariously seem to be unaware of the [Windows]+L shortcut so wasted a dedicated key to its function. You could try one of these tools as an alternative to autohotkey. You might try holding down shift and alt and then typing 8. Thanks for the help! AutoHotKey works great! When flabdablet first suggested it I tried it, but had trouble with it because I was trying to get it to use the Unicode. The script Rangefinder 1.4 posted works great! Is there anyway to get it to stop opening the AutoHotKey website when I execute the script? If you're just working in Word, there is the Math AutoCorrect function that you can enable. Essentially it substitutes something that you type and define for the actual symbol. The default behavior is to type '\degree ' and it becomes a '°'. You can change this to anything else such as shortening it to '\deg' to save on typing! It already has several common/useful symbols defined as well. I'm not familiar with HotKey, but auto correct makes it easy to produce the symbol and continue typing without taking your fingers away from home row position. Deflagro, glad you got something working for you. Is there anyway to get it to stop opening the AutoHotKey website when I execute the script? When you open your script file, do you see something that looks like this command? And you can do the same for other commands you don't want to execute when you load the script. It wasn't in the script, but just having it reload the script fixed the problem. Thanks everyone!